One of the easier species to grow as Arisaema candidissimum is more tolerant of sun than other species and appears later in the season. Grown for both its flowers and its foliage. 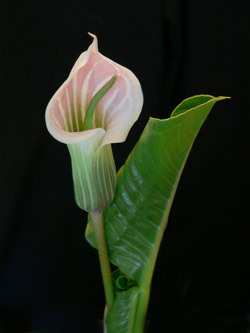 Arisaema are referred to as 'Jack in the Pulpit' or 'Cobra Lilies'. Arisaema candidissimum (pictures right) is originally from China and although a woodland plant it is more tolerant of sun than other arisaema species. In good conditions the foliage will reach around 1m (3ft) in height. Another species with tripartite leaves, two glossy large and leathery. With its single pink and white striped lightly perfumed flowers that are held upright, and thick leathery foliage after the flower has disappeared Arisaema candidissimum makes a great statement in the summer garden. Arisaema will appear in July and the foliage will last until late Autumn. Like most arisaema this one prefers a well drained soil rich in humus. Plant quite deeply, up to 12 inches. Arisaema Candidissimum can be grown in a pot or container however it will need repotting every 2 years once established as the bulbs become quite large and produce offsets. Again drainage is important, arisaema bulbs tend to rot if they become water logged. Divide arisaema candidissimum in late winter rather than early winter, it seems that disturbing arisaema before winter may be one of the factors that causes the bulbs to rot.